Speaking outsidethe legislative chamber, Ezzard Miller said the decision to hold the full scale demonstration in George Town against the East End port was as a result of the most recent developments in the LA compounding the actions of the developer. There is no point in protesting in town on the weekend, no one is there. Most people can take their lunch time around 12 – 1 so that is why it starts at noon. If Mac had any sense there wouldn't BE a counter protest. Why would you have 1 protest for ALL these topics??? I for one am 100% against the east end "quarrying" but not against the relocation of WB road so what am I supposed to do? I won't protest against them all in one… this is just a stupid idea… how should anyone know the strength of opposition to various projects this way???? I will not stand and protest development in its entirety… which this is turning into by rolling everything into 1 protest. Let people choose where their support is and just protest that!!!!!! oooookay… how bout i buy a next plane ticket to miami for the week! Didn't Bush promise us that if we develop7Mile Beach (Ritz was the first grand hotel 7 story high) everything would be better because development is good for everyone? Then Boatswains Beach was to be the answer to everyone's prayer (well, everyone in West Bay)? This is not about marching for the PPM or against the UDP. This is a march to demonstrate that the people are fed up with random, mindless and stupid developments that produce no long term results and are only detrimental to the environement and are aimed to line the pockets of a few. This is a march to demonstrate that the people care and do know what is going on and to remind the elected members are there to represent the PEOPLE and not themselves. So DO NOT make this about PPM vs UDP! You can march in this march and not support PPM! But if you want to demonstrate that the people are not just going to sit by quietly while the Island is demolished and every square inch put into concrete, then I suggest you participate in this march or you are remain quiet going forward. To the People who are already decided to participate, I suggest you start talking to other people to ancourage them to join in. I have spoken to some people and am baffled that there are still so many who a) don't seem to know what is going on or b) rather roll over and play the victim. Me too. I have spoken to several people who had no idea about the march and they said they would come during their lunch hour. Get the word out to everyone you see. Thanks to those organising this Protest. I have made up my mind to be there to support it for sure. We all, and future generations, deserve better than the madness this government is doing. Shouldn't you and all those protesters not be working. Just saying…protest on another day NOT when you have to be working!!!!!! That is why it is at lunch time. No one is in town on the weekend. Some of us realise that these issues are so important that we are taking a vacation day. There are people in Syria right now demonstrating against a tyrant. They are men and women and even children facing armed military and secret police who frequently shoot unarmed civilians in random bloodbaths to quell the rebellion and put these people under the control of the president again. Yet everyday, Syrians pour onto the streets and demonstrate. They are unarmed, and know they are risking their very lives in a bid to uproot the current dictator and install a new form of democracy and sense of justice in their land. Many are prepared to die for the cause. Yet in Cayman there are many Civil Servants, or just employees of USP supporters, who despite "wanting to", won't even turn out in a mass show of dissatisfaction with the Bush administration. Just to hang around outside the LA and shout against the incumbent? during your lunch hour? Jeez it puts a few things in perspective. Caymanians must be more lightweight than I ever believed. Sorry people, but if you are genuinely for the demonstration but won't come because of fear of retribution, then you are not only lacking in courage (that's putting it mildly) but also aiding the Bush administration, which is counting on you to sit on your hands and say nothing. Again. 12,000 signatures against the E.End project speaks volumes to the Premier and his rich posse of developers that the answer is NO! I am a bit baffled why voting constitutients would continue to sweat, blood and tears, risking heat stokes standing in the hot sun and more… risking their lives protesting each and every project that this insensitive premier, now a full grown dictator pulls from under his hat. Doesn't it make more sense to get 12,000 or more signatures and present them through a responsible and educated delegation led by an Independent minister to the UK Government, i.e. FCO Office? How about drafting a document for his removal and Yes the constitutional comissioner does have the power to present it to the UK if it is the people's wishes. Yes a delegation that speaks for the people letting them know we are fed up with illegal dictatorship and we want the premier removed as over 70% of the nation is against his actions that constantly go against the will of the people. This is good grounds to have him removed. It makes no sense wearing ourselves out trying to stop his every project. Remove him through a petition to the UK and we won't have to be bothered with him anymore. Its time to work smart not hard. No harm in doing both….. to ensure "Good Governance" eh? Those 12,000 signatures are great from a support point of view worldwide, however, we need several thousand registered voters to sign a petition to remove the Government. Mac cannot be removed by himself, unfortunately. A show of force will go a long way towards showing him we will not put up with his crazy plans any longer. Only problem is that 10,000 of those signatures are from other countries – Australians, British, Americans…all good to know where they stand, but the UK cannot really consider their votes on a Cayman issue. …….because it is much easier to roll over and play the victim. I have found this to be the case with many Caymanians time and time again. They run their mouth at home and at work, but when it comes to changing gear and jumping to action, they simply cannot be bothered but are happily complaining and continue to blame anything and anyone else for their situation. You wrote this so perfectly and you are absolutely correct. Let's see what happens. If Caymanians don't want to take their country back now, they they probably never will. I am not UDP and I am not PPM – I am Caymanian. I am for some of the projects not all of the projects. I am participating in this March in sheer defiance against the arrogance and the complete mismanagement of our finances, resources and reputation by the Premier. We have to make it absolutely clear to the Premier that the resolve of the people far exceeds his resolve or we will be forever lost as a Country. I can give up one lunch hour to make a stand for what I believe is right!!! Caymanians, residents, and civil servants should all make an appearance because to do otherwise wil indicate agreement with the dangerous precedent that the Premier and his followers are taking. Civil Servants the trick is to "observe" not participate!! Completely Agree!!!!!!!!! CS…..OBSERVE!! not PARTICIPATE!! Youre presence is what is needed. At least this government is looking for investments…not to just waste money on a number of hi tech schools for a handful of students. Hey we'll take those investors in my country any time! The schools are intended to make something out of brains like yours. We all need to unite on this we need a full show of support AGAINST the dangerous precednt that the Premier is setting. He is wrong and his heading in the wrong direction against the wishes of his people. "He said he would not acknowledge it and believed it was just a minority of people " I was on the fence about the peaceful march until I read the preceeding comment. If nothing else we need to be out in droves just to prove him wrong. The resolve of the PEOPLE should always trump the resolve of ONE man. One hour of your lunch time is nothing to sacrifice in comparison to what we will lose if some of these projects are passed. And what are you marching for? What are the solutions? How will another government make your life better? Or is this just a power struggle using the people as pawns? If PPM had such great solutions, where are they? Why not publish them? How will PPM make the recession go away if not by bringing investors here? Will they not have to give incentives to developers like all other countries are doing? There is no fundamental idealogical difference between UDP and PPM. Just personalities- I like my tribal leader and you like yours!. So what will Personality 2 do? Give incentives to developers totry to create jobs- that is the only option now. They cannot spend, government does not have the money. Until you all realise that, you will continued to be used by folks (both PPM and UDP) playing you into power control for a cozy pension while you get higher taxes! It would be great if an international media such as CNN could be present when this demonstration takes place. They wouldn't be allowed in…..remember after Ivan, were reporters not forbidden to enter the kingdom? Im sure they would pick up the story if someone sent them video footage !!! Yeah right…so everyone knows this is another third world banana republic they need to avoid! Dear people of Cayman….it is time NOW to stand and be counted! I well understand the level of fear that some are experiencing….and so do those who would have us continue to remain anonymous, in fear and invisible. 1) From "Against the Oil Refinery"….utilize your lunch hour to participate. 2) From "Bean Counter"….wear a bag (or mask/disguise). 3) While "Marching" may arguably be seen as "demonstrating against ones employer"…. then simply show up at the end site/location of the March, which is most likely going to be in Central George Town (Court house/LA Bldg). Surely each person has the Right to be in Central GT on his/her lunch hour. The citizens of Tunisia, Egypt, Libya, and Syria faced far greater peril than any of you will face when they stood up to their governments. They were opposed by soldiers with tanks and loaded guns. They faced DEATH! What did they do? They stood up anyway FOR WHAT THEY FELT WAS RIGHT. Is their courage so much greater than yours? Do any of you love your country less than they love theirs? If not, than NOW IS THE TIME FOR ALL THOSE WHO LOVE CAYMAN TO STAND UP! "Like" the ilovecayman facebook page. I hope if we areplanning a march, we decide to camp on the doors of the Govt. Building take water lunch and stay there. We must stand up against all this trial we are going through. Do not leave without getting a proper answer, lock down Geoerge Town if we have to. Boycot the cruise dock if we have to, but it is time the Government listens. So let me see if I get this right. Sometime ago Mac announces that he is going to sell the new Government Building and The Chuckster announces that he will lead a march in protest to it as well as some immigration issues and he invites the Premier and his Cabinet to meet the protestors on the front lawn of the Glass House to listen to their concerns. Premier Mac gets the gitters and backs down from selling the new Government Building saying publicly that the police even advised him to leave the island for security reasons if the march went ahead. So the mere threat by The Chuckster of the march stopped Mac !!! Now the PPM and others plan a march also in relation to a multitude of things and Premier Mac says he will not even acknowledge them…….a very different response from Mac this time. The question is : why has Mac become so defiant and confident ??? Is it because The Chuckster has not yet spoken on the proposed march or is it that Mac believes that the PPM will do to the others what they did to The Chuckster the last time and pull the rug from under them at the last minute ? One thing is clear and that is that MCKEEVA BUSH must be removed now !!!!!!!! I think the sale of building failed because he was made aware that sale proceeds from a public capital item must go to paying off related debt and not into current operations budget. And now he is negotiating single handedly even more complex issues. We are sunk. Plus the roof was leaking anyway which means the buyer could have gotten a nice discount. OH CHUCKIE….stop blogging about yourself in the third person..getting BORING now! A March? If you really want to see anyone listening, I hope the march consists of more then 100 people. You will need at least half of the 60,000 living on the Island to maybe make a difference, otherwise it is just a waste of time…remember the mangroves at the Ritz????? Mangroves gone, Ritz is still there…….the allmightly national trust couldn't even stop it. Civil Servants and all who comment on this website please show your support by joining the march. This is not a PPM march, it is a Caymanian march and all people who care about showing who is in charge should show up. It is your lunch hour so pack a lunch and a bottle of water. If members of the Civil Service are afraid to march they should wear a paper bag over their head for disguise. It is the body count that matters here. True power lies in the hands of the voter. Show your power by showing up. If you decide not to come then you really have no say in the future of your country. Your vote does count and the politicians know it. Show up and let them know that you know it! The Dart Group has invested millions in these islands and continues to do so. They have offered to purchase businesses and the owners have sold, that was the owners decison in a free market. It amazes me how people can blame Dart when it was the owners who agreed to sell, if the owners were forced to sell, I would think family members would not continue to work for the company. Dart wants to create another resort on Seven Mile Beach and they are willing to pay to do it. West Bay Road shouldbe rerouted, maybe it will slow people down so they stop running over tourists, you never know. It is not a bad idea to seperate the tourists from the major traffic routes. As a Country we need to embrace change otherwise it will happen without our voices being heard. Change is something that you can always count on in life, no matter how stubborn you are. I would suggest people bring ideas to the table other than ALWAYS saying NO, it is getting old and people are just tuning you out, literally. I am not in favor of the EE Port, it seems crazy to truck goods all over the island in my opinion. I live near the proposed dump location and actually think if Dart does it, it will be done well to begin with. I do get concerned that people will not want to CHANGE and will just keep doing what got us the current dump. People are about to make a major change in how we express our discontent with the inept way this country is being run. This march represents the most positive change we have ever made. This is just the beginning. There are bigger changes coming on election day. It is not a case of not accepting change to progress the Islands or stimulate the economy – it is 'how' that change is done. As you say, you are not in favour of the EE Port, so there you go, that is not a good change and should be stopped. The people have to be heard and not walked over by one man. I also support the "Dart" project as it has been presented. I have seen the kind of quality work that is being done by that group and I believe that the positive aspects of the "Dart" proposal outweigh the negatives by a long shot. 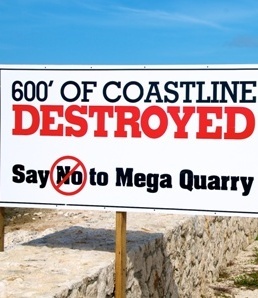 I would like to participate in the March against the EE Port/Quarry! Unfortunately the organizers have lumped the Dart project and the EE Port matter together, therefore I will not be able to march. If you do not then you will bemarched over by oppressive governance and greedy destructive developers knowingly destroying the East End Water Lens, the scenic Sea View Drive, leaving Caymanians taxpayers to pay for the entire infrastructure external to the Mega Quarry. Please people leave Civil Servants out of this, we need to render unto Ceasar what is Ceasar and unto the Lord what is the Lord's" it does not matter which Government is in power we as civil servant would not be able to participate. People posting on this story are behaving as if it is this present government that bar us from doing so. Until the policy changes and allow Civil Servants to sign petitions, participate in demonstration, write letter against the government to the press etc, I will continue to live by the rules and regulations that governs us. There's power in numbers. Mac can't fire the entire civil service, nor a substantial portion of CS staff should they choose to attend this march. The only power Mad Mac has over any of us is the power that WE give him. Peaceful, non-violent, non-cooperation is the answer. It has worked before and it can work again, but it takes EVERYONE who cares about the islands to stand up and be counted BEFORE IT IS TOO LATE! Obviously spoken like someone who hasn't had to deal with Mac one-on-one. Mac is a bully and would like nothing more than to fire as many people as it takes to "quiet the noise". Obviously spoken by a coward who easily yields to Macsbullying tactics. I have plenty to fear, believe me, but I am also a person of principles so no amount of bullying is going to stop me. Firing so many people for voicing opposition to this project in a so-called democracy would cause national controversy – the kind that would likely attracted the attention of the international press, and thus huge embarrassment to our resident bullty. I am not going to be walked all over by someone who in reality, has no right to. It's time to stand up and be counted and I fully intend to do that on Tuesday. I canonly hope plenty other have the guts too and don't chicken out. By what convoluted reasoning do you absolve the government from being to blame for not changing policy to unmuzzle civil servants? If you are not part of the solution, you are part of the problem. Fine. Be an impotent and silent lemming. See? Your leader becons you to follow. Run now! Go follow your leader off the cliff. No one misses the lemmings anyway. As for me, until my life status changes and my heart stops beating in my chest, I will continue to challenge and break rules and regulations that unduly and unfairly restrict my freedom. (So by which term did you allude to Big Mac? "Ceasar"? Or "Lord"? From one civil servant to the next, let me tell you something, the day civil servants are allowed to get politically involved will spell disaster for these islands. Our system of governance is tried and tested. Poliricks will destroy us if we are not careful. I do not support the east end seaport or the oil refinery, but there are some good proposals on the table such as getting Dart to clean up the dump in the heart of out tourism and business district, medical tourism, and getting the.old Courtyard Marriott renovated and opened as a viable beachfront resort. Let’s try and be reasonable and encourage the government on the projects that make sense and which create opportunities for our people. I do not support either party and never will as all it seems that we do now is try and tear the other side down. Truth be told, each opposition seems to want the incumbent party to fail. That can’t be good for Cayman. OH MY PEOPLE, what they should march about they dont, and that is the High electricity bills being demanded by CUC, this is what a march should be about. I am also against the seaport being built in East End. Government has you right where they want you! You are wearing blinders. You can't see the forrest for the trees. You are like the ostritch who thinks he is invisible when he buries his head in the sand. WAKE UP CIVIL SERVANTS. This is your country too. This ship is sinking partly because you are all too afraid to grab a bucket and start bailing. The day the majority of Caymanians feel constrained to express their feelings on matters that are life changing to their country is the beginning of the end. Oh, I forgot, we are already at this point. Go ahead, remain silent as the governent dictates to you and see how you like the result. If the people of Syria felt this way, where would they be? Attitudes like yours are half of the problem. Just because something is a rule, doesn't mean it is right. I hope that for once people don't hide behind their computers or just can't be bothered and take a stand. Even if it may not change a thing, I for one would like to be able to tell my children and grand children that I stood for what I believed and that I tried to do what I could to keep this sea port and oil refinery from happening….because staying silent on it is basically the same as going along with it…………. Sadly, by some of the comments posted on this blog where people state that they are afraid to participate in this march is evidence enough that we are already living under a dictatorship! How much longer are we letting this go on??? It’s really sad because, I don’t think the Caymanian people realize how lucky they are compare to other countries where the leaders are not doing anything whatsoever to help the economic situation. I have notes the people complain and complain about everything and more so if the idea comes from they own Premier. I personally would like to see the people of this country demonstrate for things such as, a better educational system and a proper trade school so they can better equip themselves to be better qualified. you guys are going to demonstrate and petition yourselves and the government into bankruptcy and the dark ages if you don’t stop getting behind these politicians….I can understand the EESeaport but your pissed at dart group(who have proven themselves already)…who want to expand our public beach and fix up a hotel that is falling down…..so what if they close part of west bay road who really gives a sh-t..it’s just the run down old entrance way to Governors Harbour? think about what you are protesting before you do…your so called leaders would march you off the east end bluff without you even realizing it..
Do they realise that No with a cross through it actually means Yes! Time for a new Government! Yes, but with so many hotheads on the scene I worry about who precisely could form a new government. We've got such a lot of animosity amongst our representatives, quite striking, actually. In my opinion anyone would be better than Big Mac making critical decisions by himself. I'm not saying all UDP members are bad… I just said a new government. We can still use the same members we just need a reshuffle and bi partisanship. This way… everyone wins. As far as I'm concerned, I have no use for the UDP MLAs. They all condone and support Mac and his dictatorial behaviour. If they didn't, they would speak out and break away. By giving the intelligent and financially adept professionals on the island Caymanian Status with the right to vote, we could actually increase the odds of electing someone who is capable of good governance and at the same time offset the bad voting habits taking place in West Bay. Excuse me!! Stop insulting Caymanians. We have enough educated Caymanians who don't need status and who genuinely love their country. Go run for plitics back in your homeland. we all know that the this udp shambles is the wrost in history……. but do you honestly think the ppm and ezzard are any better? they sleep walked us into to bankruptcy and i have heard no solutions from them in opposition….only political rhetoric….. Excellent news! And not a moment too soon! I'll be there for sure. And Civil Servants need to be there also….after all they did not give up their Democratic Rights did they? They can attend to ask questions and/or to be informed eh? Please people….It's time to take a stand! Does Cayman still qualify as a Democracy? If it did why would the people have to take a stand against its own Government? Why would Civil Servants be worried? Think for yourself man. And then take action. Marching against Big Macdinajad is a waste of time, think about it – he's running a one-man party, oblivious to the feelings of the majority, and frankly totally disregarding the future of the nation, the future of his party, the future of his own political career…..he's in a place where he's untouchable simply due to inaction…..inaction by his own party…….the fact that he has not been ousted or at the least reprimanded by his own party or constituents speaks volumes……..he'll never listen to us…..but those who will listen are the other elected members of his aprty…..its those people that should be marched upon, its those people that should be subjected to relentless lobbying, emailing, phone calling, visitations….until they realise that if they dont get rid of him, they'll never get voted back in…….right now, for some reason, they're scared to act against him…….whats he got on them??? Mega Hospital thing – this is a good idea, it could bring other industries too (creation of retirement villages/nursing/rehabiliation homes/etc)….just need to ensure we're properly regulated to stop dodgy doctors giving us a bad name….but in theory, this is a really good idea. This is my home. Have been fighting my denial of PR for 4 years now. Can I still come and take part? After reading all that it covers and having a full understanding of why, I will be there to participate. I have made Cayman my home and I'm determined to help protect it. Don't be misguided by what you've been told. You must see the maps and what this really entails. Do some investigating and stop depending on your cousin or your aunty to tell you what you want to hear. I am one also that has to work on Tuesday's. Is there not a way to force a referendum of the people on these important projects that are being decided by the lawmower man? go ahead stop development and forigin investment.i hope the caymanian youth of this country note the names of you all who was responsible for their migration to find a job. Its not about stopping development, its about stopping something that can only ruin the country. The Shetty hospital and the IT park are the only useful projects that have come to the table, and the only ones worth supporting. They are the kind of diversification Cayman needs that will generate money and also employment. Everything else will ruin Cayman both economically and environmentally in years to come…. Like the average Cayman youth is employable? To find a job you must first be qualified. Tell your leadership to help with the obvious education problems the country faces first. If you can. By destroying the island with all these projects, nothing is going to be left for the youth that you want to protect. Who is going to come here and why? To see a big port? To run into each and other tourist in a concrete jungle visting expensive shops? Create more jobs doing what and for whom? The youth is going to leave because there will be only empty estructures and buildings. No plant life, no animals, no coral, no fish, no reason to come or stay. We will be another place that in the name of growth lost everything. You are illiterate. I hope the Caymanian youth read your post and see why education is so important. You cannot seem to string one coherent sentence together. Log off and get hooked on phonics. By the time these islands wake up from this dream of traditionalism in a rapidly changing world, the gap will be so far and so wide, that the vision of the present Premier will seem like Noah's revelation. If the Port and other capital projects aimed at stimulating growth for the country seemtoo personal to the Premier and his administration, its because he has to take it to heart due to what is being unfolded now in Cayman. "If he does it, then it wrong for us", which is rubbish. Cayman need these projects. Not want but NEED! Please think, before you do what my grand mother would say "fallow fashion"!!! Yes! Just sell the country to developers! Take the money and run. Uhhh. Where you going to run too? I surely hope that this protest will instill confidence in our investors and create jobs here! Why not have a petition availiable for his removal from Govt, if we feel this strong about this mad man," lets kill 2 birds with 1 stone" . All for 1 and 1 for all, he has to go before next year, his plans on more status grants are to up his re election chances, we have to also protest his removal it wont happen in the LA because of the UDP spineless cronies, Mckeeva and ALL UDP members (GT, WB, BT, & BRAC) need to go. Good idea but it won't happen because of all the spineless everyone else you forgot to mention. Petition – tried that already, it did not make a difference. I will be there if I won't get fired. Sadly, I am not sure that this will not be the case. I work for a supporter of the Premier and the UDP who may not want his employees seen at the demonstration. What an environment of fear we live in – fear of losing our livelihoods due to the inability of our "leader" and his cronies to withstand criticism. I need my job and in the current economy I am not sure that I would be able to find another one. I support this demonstration and am appalled at the actions of this current government. If I cannot be there in body, I will be in spirit. Good luck to the people who are brave enough to stand strong. You are on the side of right and I applaud you. As a CS i feel the same way, as you have stated, thank you to all those who are able to come forward and make a stand while those of us who have no choice because of our jobs being jepordized. It is so heartbreaking & frustrating when you have to choose between your taking care of your family, and standing up for what is right!! Again a great big heartfelt thank you to everyone who isable to make it to the protest. I understand your fears; but let me tell you something, dont be fool by Ezzard Miller; I worked in a government departmetn where he was the Minister and I can afford to tell you if the shoe was on the other foot and he was the minister TODAY we dare not let our faces been seen any where close to where the demonstration is taking place. I am not aligned to any political party I m only ne who wants the best for Cayman, and ita future generation, but Ezzard is blowing his own trumpet for personal gains, Ezzard Miller is a Dictator and I still have horrified memories of the meetings and threats we endure under his leadership…he has not changed; remember Cayman "we cannot get his leopard to change it's spot". Yes, we seem to have two types in our LA : a group (and I have to say that surely there is cause for hope here because the younger generation is present) who conduct themselves with the decorum and maturity expected of those elected to represent us, and another whose approach is anything but – quite disgraceful, actually. I mean, did their mothers drop them on their heads or something? They are, overall, a pretty disfunctional lot, truth be told, and we'd be well rid of them and their tiresome histrionics. We deserve better. Have you ever stopped to think WHY the government leaders try so hard to keep Civil Servants from protesting? Civil Servants hold more power and influence than private sector employees. Do you have an idea how crippling it would be if for just ONE day everyone at Customs and Immigration put their hands under their butts? Imagine ONE day when you went to the hopital or Cayman Airways and all you got was a blank stare. (I know that the issue as to whether CAL or HSA are gov't is debatable but they certainly got the pay decrease everyone else did!). Civil Servants have this country by the b*lls and it is virtually impossible to terminate them. THAT is why 'they' try to inject as much fear in them as possible, because YOU have the real power. If that it true, at least we would have an honest dictator with a brain that actually works. This would be far better than what we have. Stop wasting people's time talking nonsense that you work for a supporter of the Premier and the udp. If you are so unfcomfortable then why work for them. Another hog wash story. Such brave words 23:26 basher. I mean, getting another job would be so easy these days, wouldn't it? Yes. Why work for anyone who makes you work for your money to pay for your life? Another Caymanian way of thought. Thanks for the tip. I do not support the proposed East End Seaport and i understand that the Oppositions job is to oppose, but lets hope that the opportunity to remediate the Dump and get 110 acres and new lined Landfill in the middle of the island is not lost in the heat of the moment. Anyone who gets fired for this definitely has a case in their favor. You’re employer would be an idiot to use such tactics (although the fact he strongly supports the premier already determines his thought process). Never use fear to justify cants or you’ll never accomplish what you believe in. That’s exactly how the Premier is thinking he isn’t afraid of and doesn’t care about what the people can do and that’s why he is accomplishing what he wants. In regards to this demonstration we all have to ask ourselves what we truly want for the future. Can we wait out this term? Do we feel this government represents the interest of the people? It’s not even the projects at hand, we have to think about everything, the laws that have been passed who they favor and what else could be in the works. I for one know that I will not sleep right that night if I chose to not attend because my right to attend will be my only democratic right thus far. My vote in the last election did nothing to produce a government that represents me and most of my family and friends and I know for a fact that I am not part of the minority as the Premier wants us to believe. That is a lame cop out and an excuse to hide behind your computer. You complain but will not act. There is nothing illegal planned here so if you refuse to turn up it is because you are a coward. We do not need your "spirit" for "faith without works….." you know the rest. It is about time that the Cayman citizens stand up for their country. It has been far too long that we all sit quietly while Mac and his cronies do as they please for their own enrichment. Cayman, this should be the start of a revolution. I can’t speak for everyone but I just will not take it anymore. Are you watching and listening Governor? Do you really understand why we are forced to march? Do you understand the history? It’s not just about an EE Port or about an Oil Refinery or about the Chinese Government getting a foothold here or about the giveaways to Dart or to Shetty or about the scant disregard shown for our Laws. No. it’s much deeper than all of these. The people have had enough. We know the history and its repeating itself. We want an end to corruption, greed, cronyism, commissions and kick-backs and an end to fear and the lack of transparency and the attempts to suppress our press. But most of all we are no longer prepared to tolerate this uncontrolled dictatorship. We want our democracy back. We want our elected government members governing with integrity. We want to rebuild our broken economy. We want a future for our children. We want to stand tall in the eyes of the world. We don’t want to remain anonymous anymore. The Oil Refinery needs to be an essential (and named) part of this Protest/March! Cheeese Louise! You are RIGHT on the button Jack! Issue: Too many issues muddled together, with a mass of discontented people – some of whom might actually agree with some projects/ideas – but the mass protest will only muddle things up. Suggestion: Create a checklist listing all issues for people to mark their support, disapproval, extreme disapproval etc. Also, indicate if registered voters, and allow an option for names/anonymous marks. THEN, the projects and public feelings can be separated, collated and used properly for change. THEN, the results could follow up with a proper referendum.. after all, this process is what the Constitution allows! Submitted by Jack M Eoff (not verified) on Mon, 06/20/2011 – 20:15. Too many f-ing projects and no way to tell anyone which ones you are for and against…. I will be there. Everyone who can should be, this is a critical time for Cayman. For those "afraid" to attend (including Civil Servants); this event also invites people who are "interested". Everyone is entitled to Basic Human/Civil Rights in a Democracy….Please "Stand up for your Rights"! Dictator type persons count on other peoples fear…. Democracy requires us ALL to take a stand! Excellent news!….and not a moment too soon. I'll be there for sure! Thanks all for organising this most important event/opportunity. These guys intent on tearing the islands population apart. They are separating the people which in itself will eventually cause unrest. They should be charged if this leads to violence..
Any discontent will be rigoursly put down. We need to show the Premier that we employ him and hehas to do as we say and even though the spineless fries are afraid to stand up to him we are not. Please people, we as Caymanians have to take back our Island and run and control how Cayman should be run and not how one Dictator wants to run it. What a surprise to hear him say he will not acknowledge us (us, as I will be marching) as he does not acknowledge anyone who opposes him, well there will be plenty that he wont acknowledge, so he better get use to it. "I wont change", well you will be changing shortly! I certainly hope he will be changed. Please please to you voters from West Bay, please do not sacrifice your homeland for a —?—- come elevation time. He’s getting millions and you’re getting fridge? Yes, and ALL of us are getting royally frigged in the process. WOW! and they are not against an OIL REFINERY! Sounds like this is SAVE OUR OWN GREED! Save those who don't have jobs from becoming employed! Save the Mortgages that will be forclosed so we can buy their homes for dirt. Save the down economy so that we can make you more dependent on us! Save your own rear ends! Come on folks, lets just create contraversy so that we can say "I did that", Where are your suggestions to creating jobs? Where are your groups to help the schools completion? Where is all the funds coming from to oppose these economic stimulations? I say we have each of you who show up donate $100 to the economy just for good faith that you do not want to oppress your fellow Caymanians. Congratulations to all of the organizers of this demonstration which shows how Caymanians still have the ability to come together when under attack by destructive government as is occuring under the UDP government. See you next Tuesday for the demonstration. 'Bout time, but I feel too many people will feel intimidated to show up and as much as I would love to walk in this demonstration, I have 3 children and I need my job and I know that McKeeva will have his spies taking note of who is participating – always the bully! Sadly your post is very true. However, there is power in numbers. Mac's practicing dictatorship is contrary to the democracy that put in him power. He has overstepped his boundaries and when he falls he will become harmless. He will no longer be supported by his cronies as they will seek shelter in the next person who has power. Indeed, this is what cowards do. This is the reason he is able to get away with what he has- by taking advantage of fear! What will you be teaching your children? What will any parent that decides to sit at home rather than go out and join in this demonstartion of peaceful protest teach the young generation? To just take it? If you know that's what he is capable of doing, then try and prove- everyone who will use this as a reason to stay away- that Caymanians are not lost in their unity. If there's one thing I've always been proud of Caymanians growing up is the hardy stubbornness and an ability to be steadfast in your beliefs. Is that gone now? Go! So at least you know your children may be proud of that fact that you cared enough about them to not simply think short term on a job that, if it is so seemingly uncertain, may not be there tomorrow whether you hide or not but were a part of an effort to conserve their home. You need to ask Mac about the party the people of the Cayman Islands paid for at Spanish Court Hotel in Kingston for the signing of the MOU. That's a nice hotel though… jus sae ying. Do an FOI request, we all need to know what this is about. First I have heard of it and want to know more details.